"I highly recommend this guide! It will save you so much time and headache whether you're building a development or production environment." "I could not have been more pleased. [...] He really covers it all, even the PowerShell scripts are included and I learned a thing or two from his code as well." Understand Service Packs, Cumulative Updates, Public Updates, Feature Packs, What's my Patch Level? 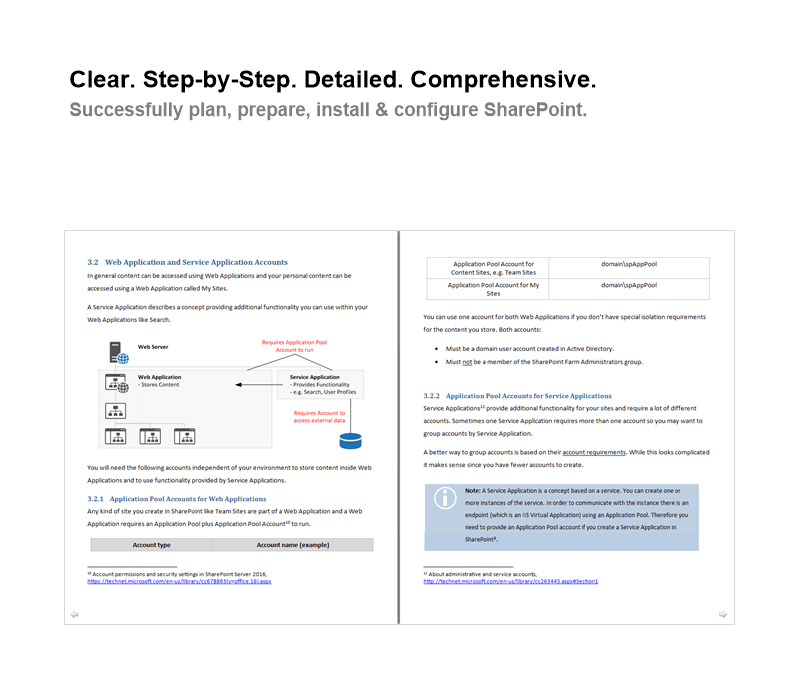 "This is the most comprehensive SharePoint build guide I have seen. [...] It will save you so much time and headache whether you're building a development or production environment." "As consultants in the SharePoint space we often threaten to write a build guide. But we never seem to have the time. Tight deadlines, rushed PM or customer requests, helping out a colleague in a pinch ... there's just never enough time. So I hear about Andreas's guide from a friend and decide to give it a try. I could not have been more pleased. 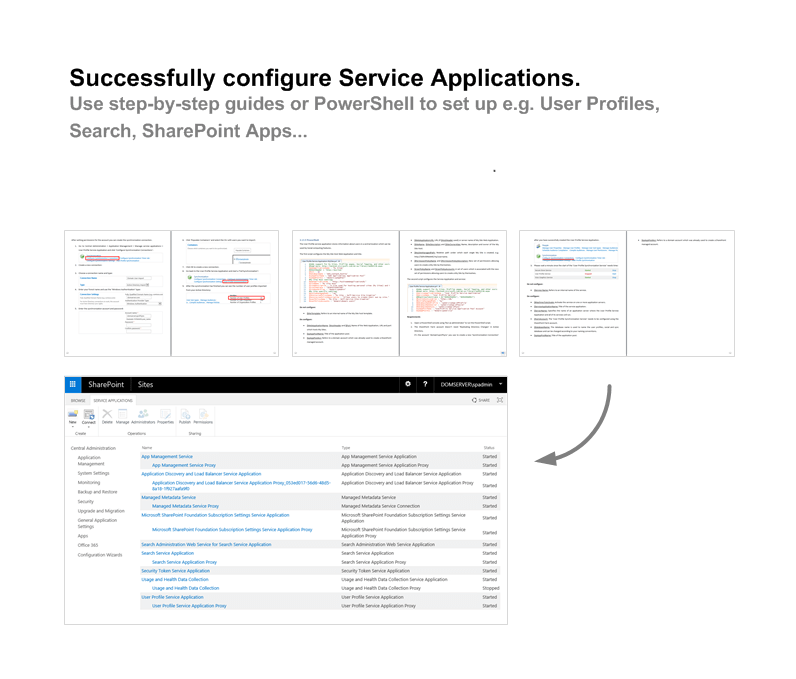 This is the most comprehensive SharePoint build guide I have seen. He really covers it all, even the PowerShell scripts are included and I learned a thing or two from his code as well. I highly recommend this guide! It will save you so much time and headache whether you're building a development or production environment. Thanks for all the hard work Andreas, the SharePoint community benefits in a major way from dedicated folks like you." 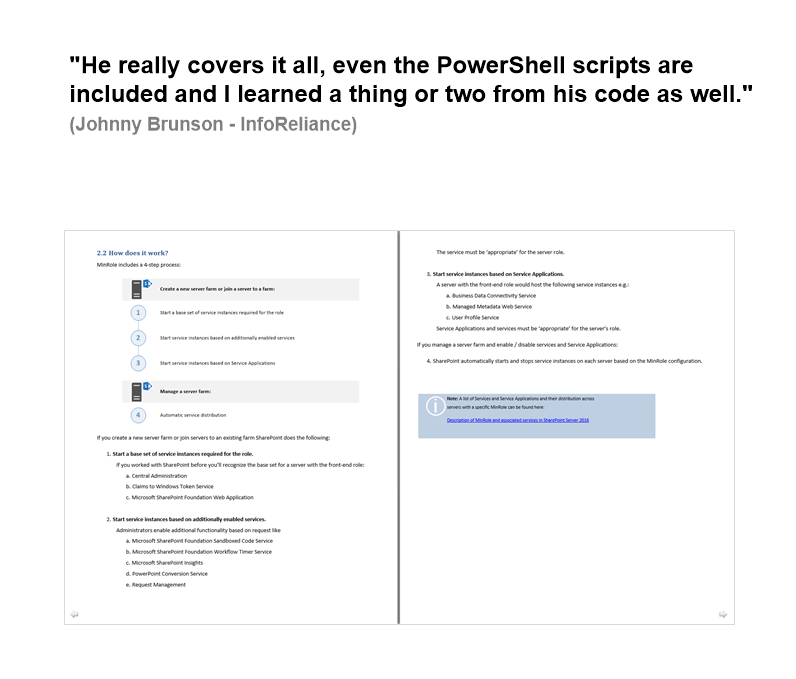 "His PowerShell scripts are accurate, easy to read, and assisted me in not only implementing configurations but also learning and understanding PowerShell features and capabilities." "I have been working in the SharePoint community for military, government, and commercial clients since the inception of MOSS 2007 performing advanced configurations, architecture, and .NET development. 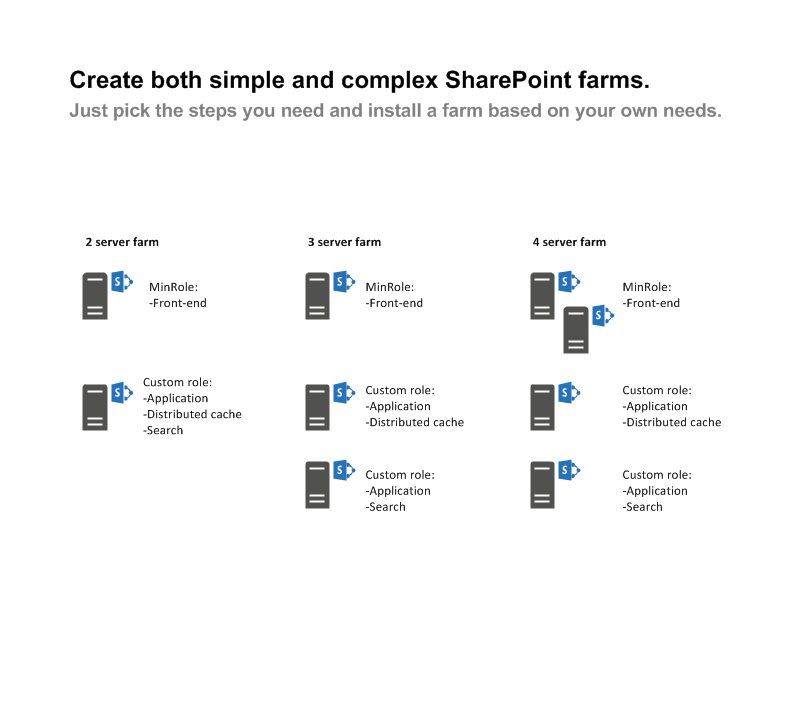 During the early years of operating I was introduced to Andreas Glaser’s SharePoint material and have since relied on its accuracy and step by step displays to create both simple and complex SharePoint farms. 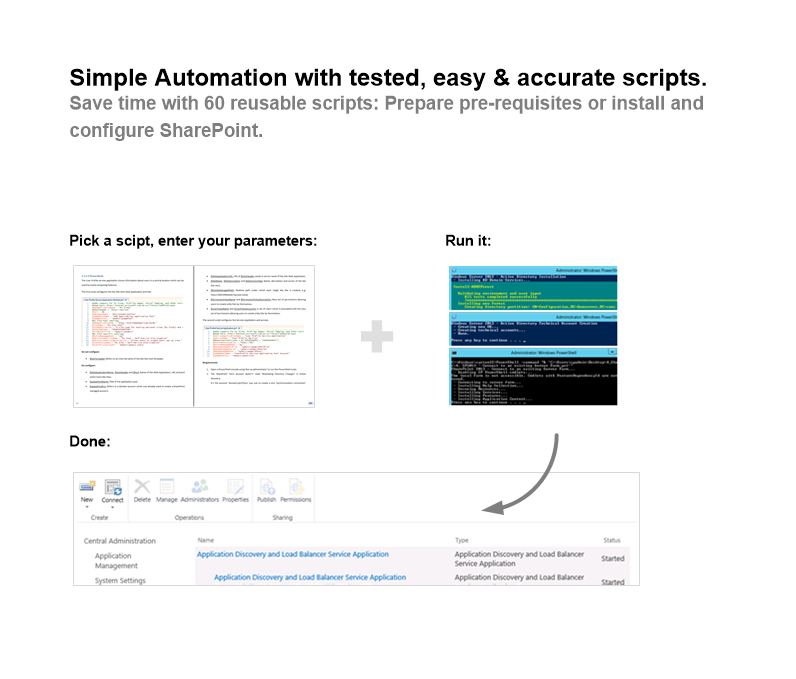 His PowerShell scripts are accurate, easy to read, and assisted me in not only implementing configurations but also learning and understanding PowerShell features and capabilities. Much of my evolution has been heavily influenced through the exposure of Glaser’s PowerShell which has allowed me to expand and grow into a more effective enterprise solution architect and .NET developer. I consistently recommend these SharePoint tutorials to students, interns, and other resources that work with me in the SharePoint community. There is no other SharePoint resource I rely on more." "[...] for every SharePoint version – no matter if 2010, 2013 or 2016 – the material is clear, logic and stringent. I was immediately able to set up other SharePoint versions after I became familiar with the 2013 one." "I am have been working with SharePoint in enterprise environments over 10 years and decided to learn SharePoint development. Even with my background it is a great challenge since you have to be a good web developer and should be able to do common SharePoint farm administration jobs as well. So I tried different ways. Only with the SharePoint tutorials from Andreas Glaser I was able to make a breakthrough. Especially the scripts saved very much time since it boosted my try-and-error phases! Another great advance: for every SharePoint version – no matter if 2010, 2013 or 2016 – the material is clear, logic and stringent. I was immediately able to set up other SharePoint versions after I became familiar with the 2013 one. I my eyes the tutorials from Andreas Glaser is the best source to learn SharePoint administration." Instant download. 30 Day Money-Back Guarantee. Hi, my name is Andreas and I'm the author. Back in 2007 SharePoint was released without a lot of documentation. The community had to evolve. Microsoft's marketing division was on steroids. And we had a lot of orders. I had to redo my first installations and wasted days of doing the same steps again and again. 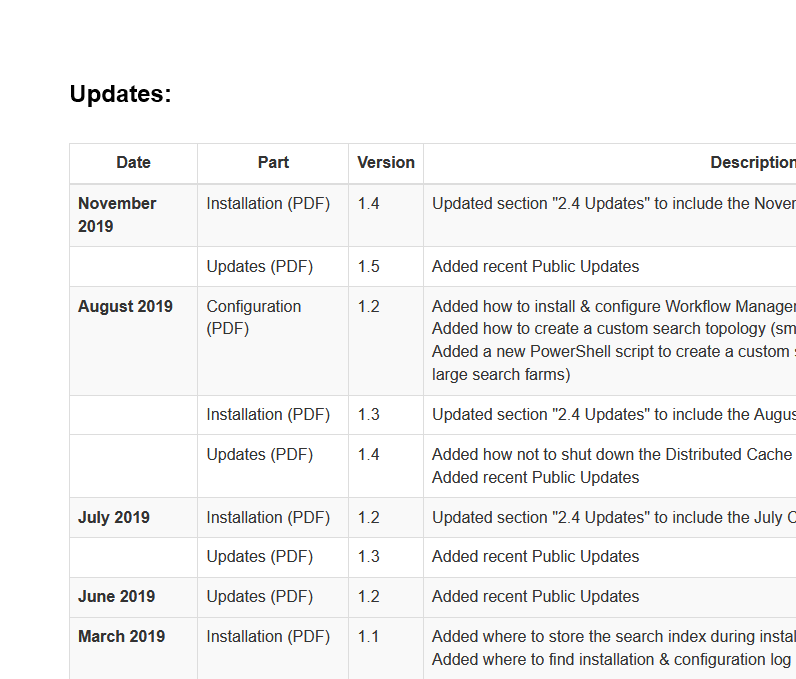 That's why I created installation guides for SharePoint 2019, 2016, 2013, 2010 and 2007. You can benefit from 10+ years of installation experience, 100+ installed, configured & reviewed environments, SWISS Top 500 companies and 100+ hours of refinement. And: 407+ companies around the world used my SharePoint 2016 installation material (November 2018). This material is brand new so there aren't many reviews yet. Anyway, please visit my review overview to see how my previous material helped my customers successfully installing SharePoint. How did the material solve your needs? 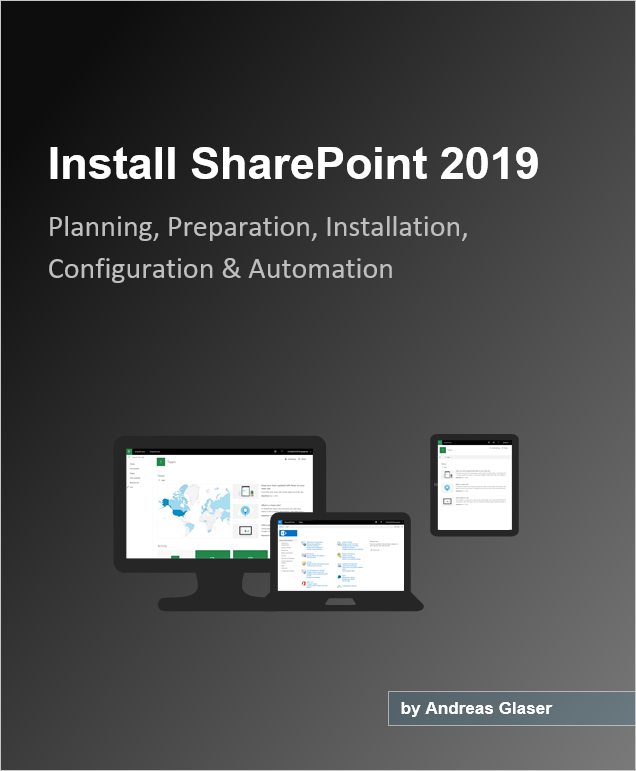 With Andreas's material I have now fully deployed an ECM environment with SharePoint 2019. 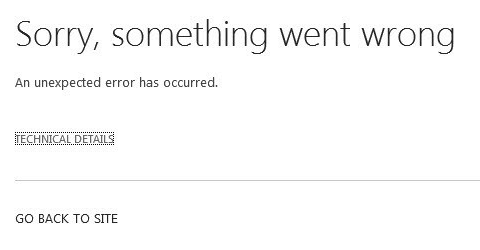 I have now fully deployed an ECM environment with SharePoint 2019. Did the material solve your needs? Server Up and Running, installation took actually no more than an hour. This is amazing! All future updates are of course free for every customer. I have a specific scenario, does it help me? Yes! And here's why: Each part of the document is modular. If you just need a Windows Server and SharePoint that's ok. If you also need accounts planning, SQL Server and several SharePoint servers just add the parts to your individual installation process. I'm a beginner and very new to SharePoint, is the book for me? Yes. 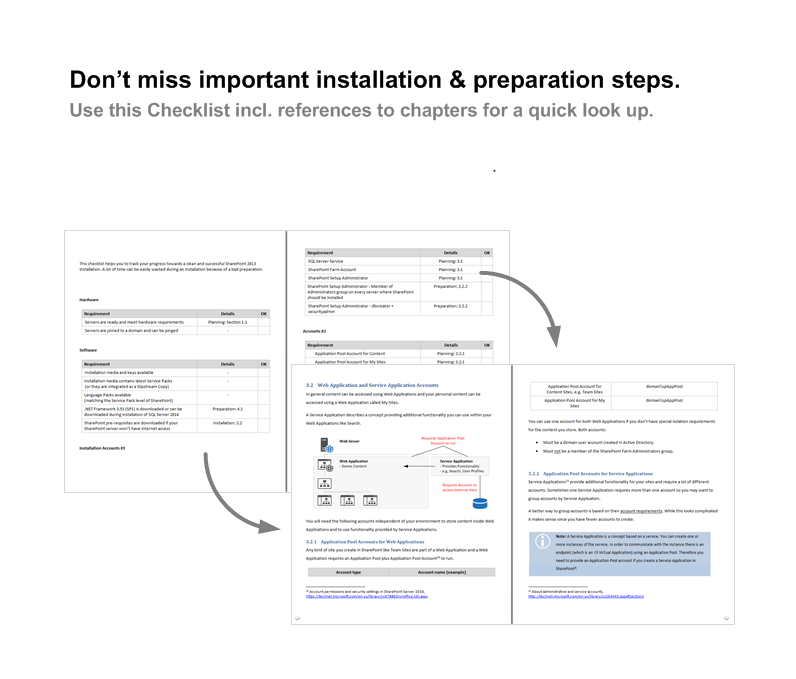 You'll get clear, easy to follow steps and lots of pictures starting with preparation and ending with a successful installation. I'm experienced with SharePoint, is the book for me? 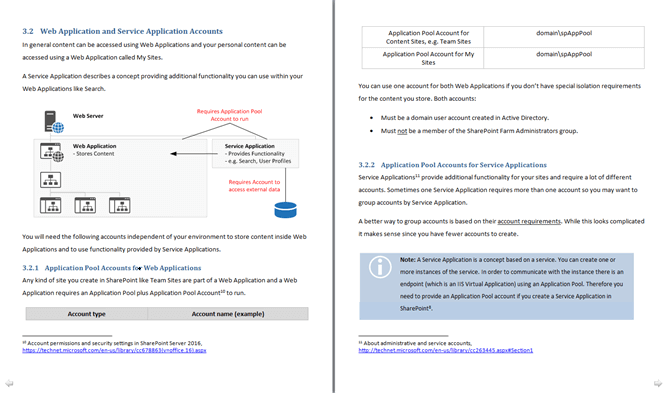 I've written the book with experienced SharePoint administrators and developers in mind too. There are lots of topics including script automation or accounts and permission planning for Web and Service Applications. Doesn't a book go out of date as soon as it's published? This is part of the reason why I made the book digital instead of hard-copy. I plan to update the eBook every few months so that you always have the most up to date information. Does this material include Scripts for creating Service Applications? Yes! 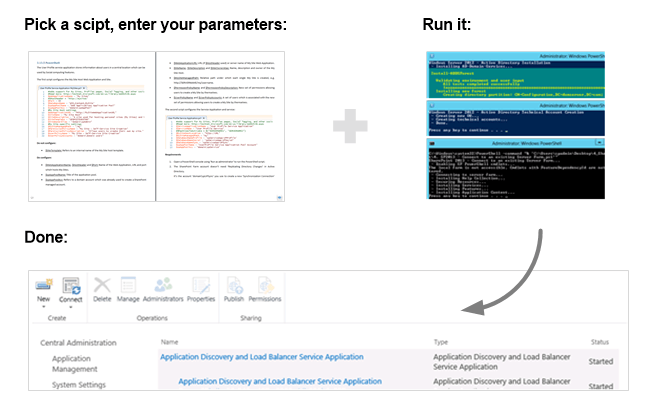 There are scripts to create every Service Application like e.g. User Profiles and Search except Office Web Apps and PowerPivot. Does this material cover high availability? Although you can install multiple Web- and Application Server it doesn't discuss high availability or multiple SQL Server (clustering or mirroring). Does this material cover Kerberos and SPNs? Sure just write me an eMail with your question and I will answer as soon as possible. "If I don't like the material can I get a refund?" If the material isn't helpful to you and you don't get the desired results within 30 days of purchase just send me a message and I'll refund your money, no questions asked.